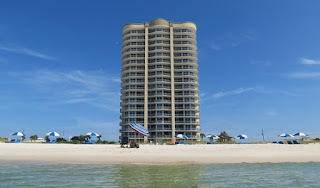 Mirabella beachfront condo for sale in Perdido Key Florida. 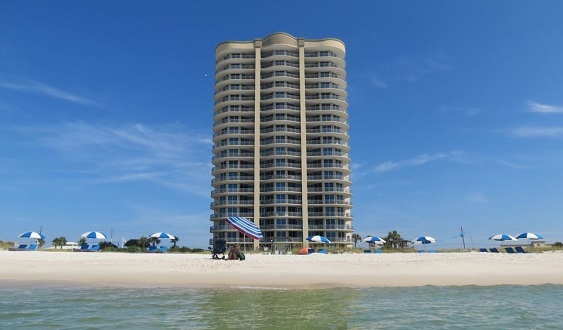 This gulf-front home with 2,265+/- sq. ft. is stunning - interior upgrades and appointments, including granite counter-tops, tile back-splash and stainless steel appliances from the Frigidaire Gallery Collection. The kitchen features under cabinet and recessed lighting, a pantry closet, a built-in KitchenAid wine cooler and a center island crowned with a stylish lantern chandelier. A separate wet bar with its own sink and ice maker is perfectly situated next to the dining area. Each of the bedrooms has balcony access and all have tile flooring laid in a handsome wood plank style. All baths were updated in 2013 with new Kohler toilets, new tubs, sinks, hardware and accessories. The Master Bath features a beautifully tiled step-in shower with glass enclosure. The closets all feature custom built-ins. The HVAC, TVs and furnishings, as well as the kitchen and bath upgrades, were completed in 2013. The living room was refurnished in 2016. Much more...come see this one!